Audio Editor X integrates multitrack audio editor, converter and recorder for windows and supports popular formats including MP3, WMA, WAV, OGG, CD.You can cut, copy, paste, edit and mix multitracks to make music. Audio Editor X provide a Free audio batch converter to help you convert WAV to MP3, WMA to MP3, CD to MP3, MP3 to OGG, or convert these formats among each other. There is a powerful recorder to assist you in recording any voices. Edit, record, convert and mix music files, support popular formats. ...... want. Audio Editor X is high quality, intuitive and powerful software will help you make digital music very easy. 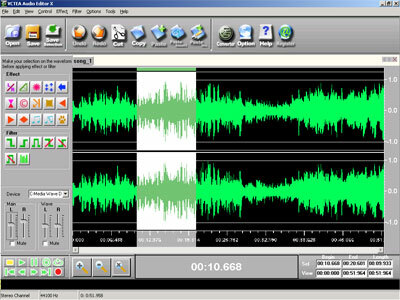 With this multitract audio editor software, you can cut, copy, paste, edit and mix multitracks to make music for your website, powerpoint, mobile ringtones, flash, iPod, etc. * Supports a number of file formats including Windows PCM (WAV), MP3, Ogg Vorbis, WMA 9 and Audio CD Tracks (CDA). * Audio effects include, Amplify, Normalize, Compressor, Reverse, Invert, Repeat, Echo, Phaser, Fade In, Fade Out, Change Speed, Change pitch, Change Tempo and more. * CD extraction can digitally extract tracks from audio CDs to your hard drive for project use. DB Audio Mixer & Editor is a visual audio files editor for sounds and music. Mix, Edit, Record, Play and do more with your music! Qweas is providing links to Audio Editor X 1.4.0 as a courtesy, and makes no representations regarding Audio Editor X or any other applications or any information related thereto. Any questions, complaints or claims regarding this application Audio Editor X 1.4.0 must be directed to the appropriate software vendor. You may click the publisher link of Audio Editor X on the top of this page to get more details about the vendor.